Roz Laws goes to Gotham for a close encounter with DC Comics’ billion dollar marvel. I’m in Gotham City, on the hunt for Batman. With no Bat Signal visible in the sky and the location of the Batcave a secret, where should I start looking? A tip-off from Commissioner Gordon leads me to an office block on Broadway. It doesn’t look like much from the outside, but take the lift to the third floor and...KAPOW! There he is, the Caped Crusader. I should have known to come here, to DC Comics, where the superhero began life in 1939. I’m in New York for the launch of Batman Live, an arena show which kicks off a global five-year tour next summer in England, stopping off in Birmingham in August. But DC Comics isn’t just about Batman. In the corridor by the lift is a huge mural, painted to commemorate their 50th anniversary, 25 years ago. Proudly standing in the centre are their most famous creations, Batman and Superman. I recognise Wonder Woman, Green Lantern and The Flash, but also featured are Rawshack from Watchmen, Captain Marvel, Swamp Thing, Plastic Man, Phantom Stranger – and Amethyst, Princess of Gemworld, chatting up Robin with a mischievous glint in her eye. Touring the offices, I try to act like Superman’s newspaper reporter alter-ego Clark Kent. There on the seventh floor – called Metropolis – is a life-size figure of him, sitting with the phone to one ear as he takes shorthand notes. If only I could type at 3,000 words a minute. Next to the Daily Planet reception desk is another figure of Superman flying in, by the telephone boxes in which he has clearly just changed clothes. There’s a piece of kryptonite in a case nearby, but BJ tells us not to worry about the radiation because it’s behind lead-lined glass. The walls are covered in fascinating artwork and covers, like the 1978 drawing of Superman taking on Muhammad Ali in the boxing ring with faces in the crowd from Donny Osmond and Frank Sinatra to Jimmy Carter and Pele. On display are Mr Freeze’s gun and Catwoman’s whip, as used by Arnold Schwarzenegger and Michelle Pfeiffer in the films Batman & Robin and Batman Returns. Working at DC Comics doesn’t seem like an average office job. A woman walks past with horns and a red tail, apparently because it’s Halloween weekend, but nobody bats an eyelid. “If you see anything weird, it’s just part of daily life here,” says BJ. Five or six people work on each edition of a comic, from the writer, penciller and inker to the editor. Technology means they can all be in different countries. Then it’s back down to the third floor, called Gotham City, and our surreal encounter with Batman himself. The man behind the mask is suitably muscular and gravel-voiced. As we line up to have our photograph taken with him, the women among the group – and to be honest, a few of the overawed males – go a bit weak at the knees. One woman pretends to faint in his arms. Holy photo opportunity, why didn’t I think of that? Batman Live is set to be a visually stunning arena show featuring the Caped Crusader plus all our favourite characters – his trusty sidekick Robin, butler Alfred and villains including The Joker, The Riddler, Catwoman, Poison Ivy and The Penguin. It is the brainchild of producer Nick Grace, who reveals his own secret alter-ego lives in Stourbridge. His twin brother Paul, who looks remarkably like him, is the technical director of Birmingham Royal Ballet. The show will feature stunts, pyrotechnics, illusions, video screen sequences and even high-flying circus acts. New music has been recorded by an 80-piece orchestra at Abbey Road Studios and writer Geoff Johns has devised a new storyline, which centres around Robin. 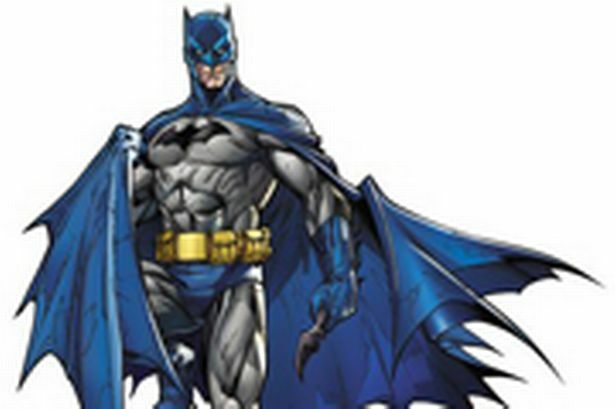 DC Comics artist Jim Lee says: “I think it’s awesome to use the character in a live arena show. “Batman is really just a regular guy like us, but worth $1 billion and with really cool gadgets! Jim also revealed some of the tricks of his trade. “I have to act the role as I draw scenes,” he says. “I find myself pursing my lips when drawing Poison Ivy or gritting my teeth while drawing Batman. I don’t think of myself as a violent person, but I have to start thinking about that last budget meeting and all my frustrations. * More than one million Batman figurines are sold every year.